Robert Vadra was given a one-hour lunch break and he left the ED office at around 8.40 pm for the airport. Robert Vadra's questioning resumed after he reached the ED's zonal office. 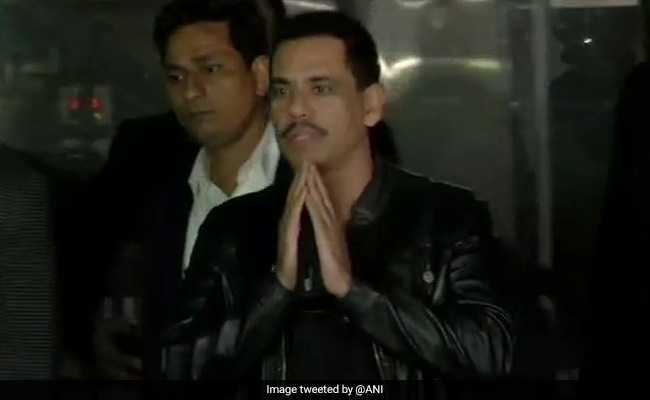 Robert Vadra, Congress president Rahul Gandh's brother-in-law, was quizzed by the Enforcement Directorate officials in Jaipur for nine hours on Wednesday after he appeared before the agency for the second consecutive day in connection with an alleged land scam in Bikaner district of Rajasthan. Mr Vadra's questioning resumed after he reached the ED's zonal office at Bhawani Singh road at 10.26 am. He was given a one-hour lunch break and he left the ED office at around 8.40 pm for the airport. Mr Vadra and his mother Maureen had appeared before the ED on Tuesday. While his mother was allowed to go after some time, Vadra was grilled for nearly nine hours. The Rajasthan High Court had asked Mr Vadra and his mother to cooperate with the agency after they approached it seeking directions that no coercive action be taken against them by the ED. A case was registered by the ED in 2015, taking cognisance of a clutch of first information reports and charge sheets filed by the Rajasthan police after the Bikaner tehsildar complained about alleged forgery in land allotment. Mr Vadra is also facing accusations of irregularities in land deals in Haryana''s Gurugram district. He has denied any wrongdoing.